Albert Bandura is David Starr Jordan Professor of Social Sciences in Psychology at Stanford University. He received his bachelor’s degree from the University of British Columbia in 1949 and his Ph.D. degree in 1952 from the University of Iowa. After completing his doctorate, Bandura joined the faculty at Stanford University in 1953 where he has remained as an active faculty member now in the 56th year to pursue his career. He served as chairman of the Department of Psychology and was honored by Stanford by being awarded an endowed chair. Bandura is an innovative scholar whose pioneering work in social cognitive theory has served as a rich resource for academics, practitioners, and policy makers alike across disciplinary lines. His illustrative career includes groundbreaking work spanning a broad range of areas. His seminal research on social modeling expanded our view of human learning and the growing primacy of this mode of learning in this electronic era. His later research on self-regulatory mechanisms laid the theoretical foundation for his theory of human agency. These diverse programs of research blend his theoretical interests with an abiding concern for the use of our knowledge for human enlightenment and betterment. 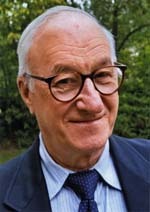 Bandura’s contributions to psychology have been recognized in the honors and awards he has received. He was elected to the presidency of the American Psychological Association and the Western Psychological Association, and appointed as honorary president of the Canadian Psychological Association. Some of the awards he has received include the Distinguished Scientific Contributions Award of the American Psychological Association; the William James Award of the American Psychological Society for outstanding achievements in psychological science; the Thorndike Award of the American Psychological Association for Distinguished Psychological Contributions to Education; the Distinguished Contribution Award from the International Society for Research in Aggression; Healthtrac Award for Distinguished Contribution to Health Promotion; Lifetime Achievement Award of the Western Psychological Association; Award for Outstanding Lifetime Contribution to Psychology of the American Psychological Association; Gold Medal Award for Distinguished Lifetime Contribution to Psychological Science, American Psychological Foundation; Grawmeyer Award for the Power of Ideas, and a Guggenheim Fellowship. He has been elected to the American Academy of Arts and Sciences, and to the Institute of Medicine of the National Academy of Sciences. He is the recipient of seventeen honorary degrees. * The FABBS Foundation would like to thank Drs. Laura Carstensen and Jay McClelland for nominating Dr. Bandura for this honor and for leading the effort to spread the word about his nomination. Would you like to honor Dr. Bandura? It’s not too late to have your name added to the list of donors! You can make your donation to Dr. Bandura’s In Honor Of… campaign at anytime.